James Harden and Giannis Antetokounmpo are the frontrunners for the MVP but what other guys deserve consideration? The Crossover on the top second-tier candidates. The MVP field has narrowed to two as we close the second half, with James Harden and Giannis Antetokounmpo exchanging blows for the league’s top regular-season honor. Each player has their respective case. Harden is in the midst of a historic scoring season, on par with Kobe Bryant’s best years post-Shaq and Michael Jordan’s scoring peak in the 1980’s. Antetokounmpo’s path to the award is more traditional, cruising through 82 games with the league’s best record and an enormous two-way impact. Plenty of ink has been spilled over each player’s MVP credentials, and if 2016-17 is any reminder, endless litigation of the award can be more tiresome than illuminating. Instead, we at The Crossover wanted to look past the league’s top two, and examine the seasons of five likely All-NBA selections. Here’s who has the best case for the MVP outside of the two-man battle between Giannis and The Beard. Paul George was the likely third-place finisher in the MVP before the All-Star break, but a recent swoon gives Embiid the edge. And let’s not look past the big man’s dominant season. 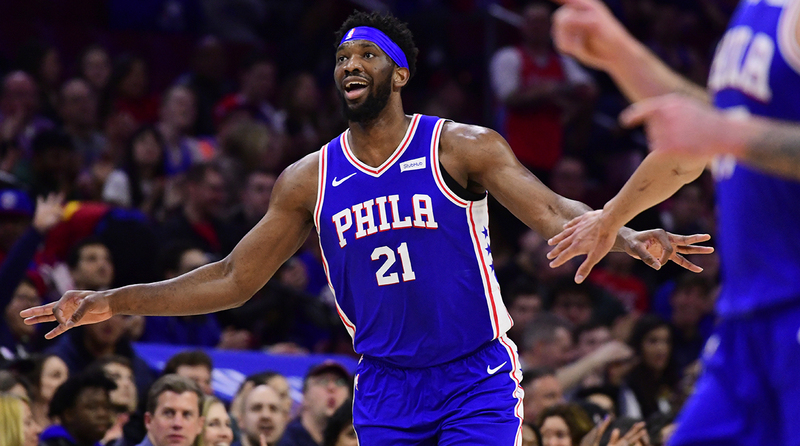 Embiid is up to 27.5 points and 13.7 rebounds per game in 2018-19, both career highs along with the league’s No. 2 usage rate. Not only does Embiid’s production zoom past the rest of the league’s centers, it compares favorably to the greatest offensive seasons of the past four decades. Embiid is just the third center to average at least 27 and 13 since 1980, joining Moses Malone and Shaquille O’Neal. Each of the Sixers’ top six three-man units by net rating feature Embiid. He’s the linchpin of their attack, and the key to their Finals’ hopes. An MVP could be on the horizon in the next decade. George would have a better case if the season ended two months ago. He was a dark-horse pick to win the MVP before the All-Star break, but the former Pacers star was fallen off over the last 17 games following the festivities in Charlotte. His efficiency drop is notable. The Thunder are 7–13 in their last 20. They have the league’s third-worst offensive rating since the All-Star break. Oklahoma City currently sits tied for eighth in the West and could very well meet Golden State in round one. George’s season was impressive, but will likely end in April. The Joker is the people’s choice for MVP this season. Denver’s doughy delight leads the West’s potential No. 1 seed, dominating with a gleeful knack for sharing the ball. Jokic’s 7.4 assists per game are the most of any Non-Wilt center in NBA history. He’s Bill Walton-esque with a flair for the dramatic, the heartbeat of the league’s top offense. 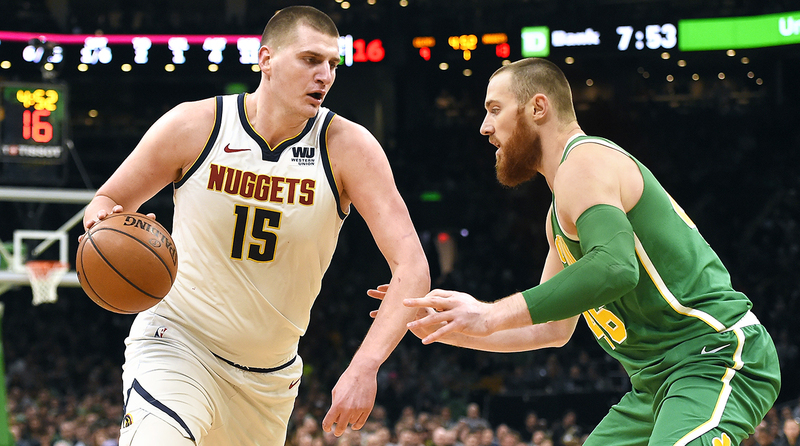 Jokic has revived the Nuggets as a contender in the West, impressing NBA fans en route to Denver’s first 50-win season since 2012-13. He’s the most unlikely contender in the field, but a worthy one nonetheless. These two can return to the MVP chase if Durant chases New York dreams, but they're currently cancelling each other out amid brilliant seasons. Curry is canning more threes per game than his unanimous MVP season, averaging the second-best scoring mark of his career. He’s on pace for his sixth season shooting 40% from three and 90% from the line. One more year and he’ll tie Steve Nash for the most all-time. Durant continues to climb the all-time points leaderboard at an impressive rate. It feels as though he’s largely coasted to 26.6 points per game this season, 61 points away from his sixth year of 2,000-plus points. Yet even at such a significant output, he’s rarely erupted for a huge night, especially with Curry in the lineup. Durant’s two highest-scoring nights came on Nov. 26 and Nov. 29, totaling 100 points in a pair of Curry-less contests. He could have every opportunity to gun for the MVP in a new location next year. For now, he’ll have to settle for an All-NBA selection and potential third-straight Finals MVP. Kawhi Leonard (too much rest), Kyrie Irving (too much drama), LeBron James (his team has 35 wins), Damian Lillard (he was better last year).